There is something mystical about lake stones and I'm drawn to them whenever I find myself on a Great Lakes beach. I had a sizable collection of Lake Superior and Lake Michigan stones and ran out of ways to display them. I was inspired by a Lil Fish Studios tutorial (excellent!) and the gorgeous felted rocks they create. This is my own take on felting stones with hand dyed wool and adding embroidery and beads. Start by wrapping medium sized, smooth stones with dyed wool roving. Lay out strips of roving to make a piece wide enough to wrap around the stone. 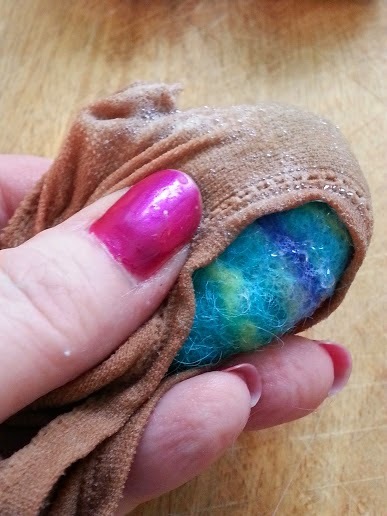 Wrap the stone and use a felting needle to secure the roving. Add enough roving to cover the whole stone with a good layer. Take some strips of contrasting colors and wrap it around the stones to mimic veins in real rock. Next, you'll need to felt! There are a couple of ways to accomplish this. 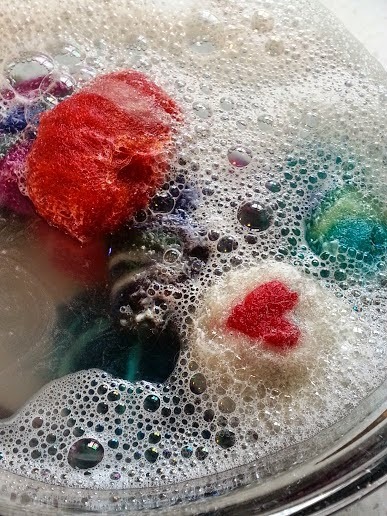 You can drop them in hot soapy water and wet felt them the traditional way, by squeezing them gently with a lot of soap until they begin to mat down, then rolling them in mesh or bubble wrap. There are lots of articles online about how to wet felt. If you want to make a lot of stones (for gifts), I'd recommend the Lil Fish way, using old stockings and a washing machine. It will speed things up! You can then cut the stockings open and your stones will be ready for use or embellishment. These look gorgeous piled together in a bowl, but since I wanted to give mine as gifts, I decided to continue by adding some random embroidery and a little beading. You can try a variety of embroidery stitches and techniques and go wild! When you're done, sit back and appreciate your handiwork. Then make some more! I've heard of the stones on the shores of lake Michigan! These are wonderful! Well I came home from the coast with pockets full of rocks...but I usually pick up smooth white rocks, so I cannot bear to cover them. SO I am going to cover plain old dog rocks (the kind we used to throw at mean dogs) and put them in a bowl with my smooth white beach stones - thanks for the good ideas!